Phison is one of the most successful SSD controller designers that sells controllers on the open market. Phison's controllers range from tiny low-power chips for USB flash drives and memory cards up to high-end NVMe SSD controllers, ending up in drives such as the Kingston A1000, and the Patriot Hellfire. The Phison E12 is its latest flagship NVMe controller intended for high-end consumer SSDs and enterprise SSDs. We have an engineering sample of Phison's reference design for a consumer M.2 NVMe SSD with the E12 controller and 1TB of Toshiba 3D TLC NAND flash memory. 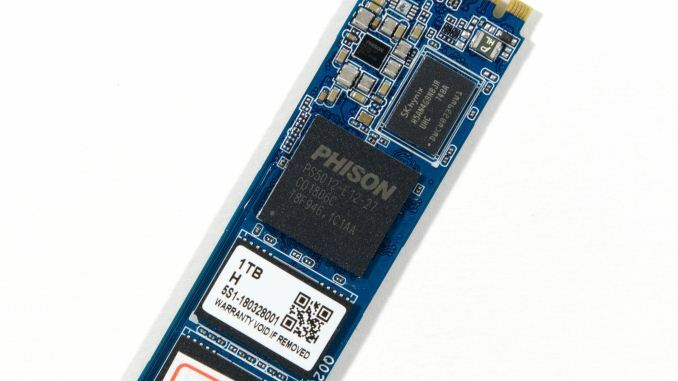 Phison — and the many brands that base their SSDs on Phison designs — are hoping that this new combination will be able to compete against top SSDs from the vertically-integrated giants like Samsung and Western Digital. It's about idle power. It's higher on PCIe.